School of Law has raised $ 23,455 from 106 gifts! A Duquesne University legal education offers a special emphasis on justice and service. The School of Law lives this mission and addresses new challenges in legal education every day through the support of law alumni and friends. Clinical Legal Education, the instructional cornerstone that provides students with real-world practical skills and directly serves community needs. Scholarships for highly qualified law students, including those from diverse backgrounds, during difficult economic times. Expanded bar studies, including personalized training and support, to give every student the chance to excel on the bar exam. Upgraded facilities to create an enhanced learning environment. Please donate today to one or more of the School of Law’s priority funds. Every gift is welcome! After making a donation of any size, please spread the word about this special giving opportunity via social media, e-mail, text, or word of mouth! 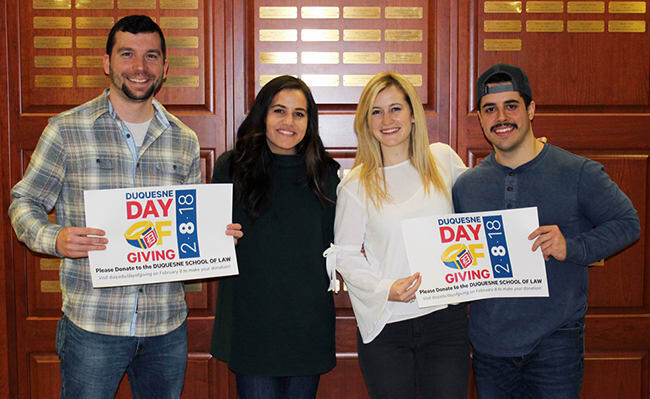 Share the Duquesne Day of Giving website address (#DUQDayofGiving) and encourage your family and friends to make a donation. Consider becoming a Day of Giving Ambassador, too. Your donation and help mean everything to making this day a success. Thank you for all that you do for Duquesne Law! If 50 individuals donate to the Duquesne School of Law the Duquesne Law Alumni Association (DLAA) will donate $2,500; an additional $2,500 if 75 individuals donate; and DLAA Past President Garry Nelson, L'82 will personally donate $2,500 if 100 individuals donate!